The days of dark and drab laundry rooms in the basement are coming to an end as more homeowners move the laundry room upstairs to the second floor. We spend so many hours doing laundry that there is no need to sacrifice style and quality when designing your homes laundry room. If you design a space with quality materials including a durable granite, slate, or quartz countertop, you will undoubtedly enjoy your time in the laundry room and make doing laundry less of a chore! It goes without saying that your laundry room will get a lot of use, and, consequently, take a lot of abuse. For that reason, I would not suggest stones like marble, limestone, or even soapstone. Granite, slate, or quartz would be the best option. 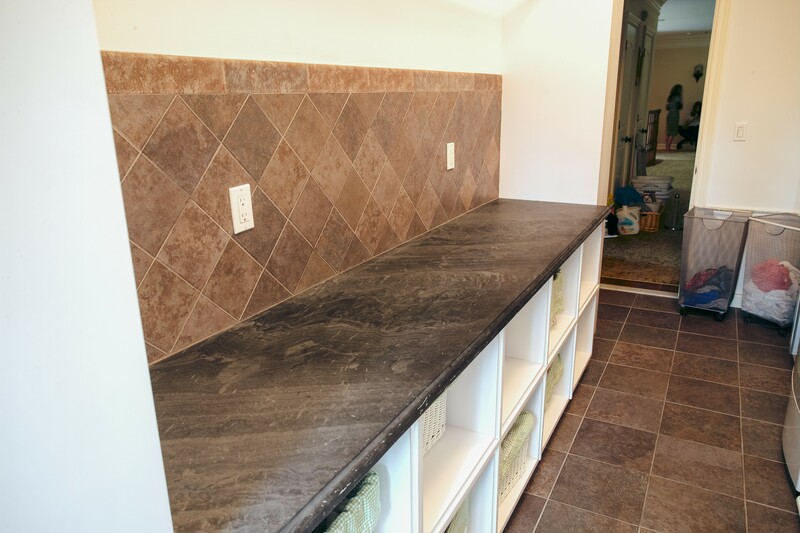 Slate Countertops are an excellent choice for your laundry room because it is incredibly durable and non-porous. It requires less maintenance than granite and is super easy to clean. It will not absorb any liquids. So, if the laundry detergent drips, you will be problem free. While slate is traditionally gray to blackish in color, you can also find slate with hints of other colors like green or even blue. The corners of slate can be sharp, which is why many homeowners choose to round off the edges of slate countertops. Granite is always a popular option because of its uniqueness and relative durability. However, it requires a bit more maintenance as granite needs to be sealed at least once a year by a professional. Nevertheless, granite might not be a better option than slate, but granite is still a worthy option for your laundry room counters. It's biggest advantage over slate is the diversity of colors and patterns, which will allow to serve as the inspiration and focal point of the room's overall design aesthetic. Quartz also provides an excellent countertop for a laundry room. It is more durable and requires less maintenance than granite. Since it is engineered, you can find quartz in many different pigments to fit your style. 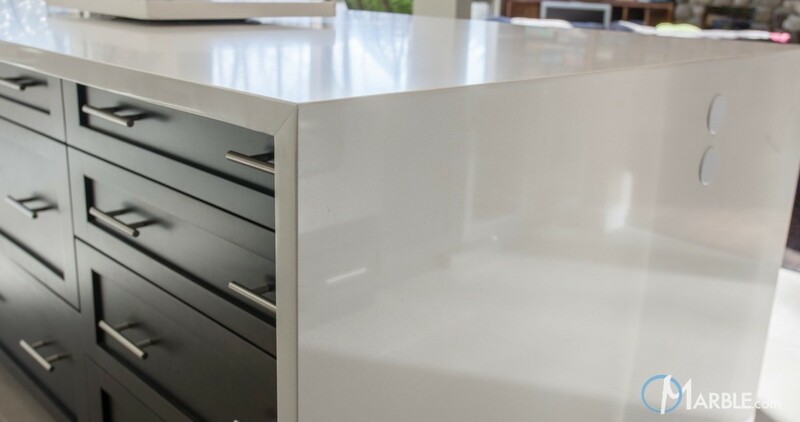 Quartz does not need to be sealed annually like granite. When designing your laundry room, it’s best to maximize the countertops around the washing machine and dryer. This gives you ample space to fold and organize your clothes. I also suggest adding a stainless steel sink in the laundry room if space allows. You can custom fit your granite, slate or quartz countertops around the sink. The popularity of front loader washing machines has opened up a much greater potential for surface area in a laundry room. You can install a countertop over the machines to serve as a spot to fold and organize your soaps and cleaning supplies. Once you select the countertops for your laundry room and design the layout, you will also need to determine what types of floors to install. Tile has always been a common choice for a laundry room as they handle moisture better than the other options. Slate, wooded tiles, and laminate flooring are also other choices available. A slate floor paired with slate countertops can leave a strong visual impression. Being a fan of wooden tiles on the market, they have the look and feel of wood with the durability of tile. The last aspect of the laundry room to consider is color for your walls. Your stone countertop choices will probably be the star of the show but you will want to choose colors that will complement them. Since they are typically smaller spaces, you may not have much room for wall art, but you can play with color to make your laundry room a place that is fun to be in. I believe the laundry room is almost as important as the kitchen. So, there’s no reason to sacrifice quality materials in your design. You may end up spending a lot of time in there and will much prefer a clean, bright, and cheery place to a dark basement cellar.